It is important to add a dorm room headboard to your college essentials list for a number of reasons. 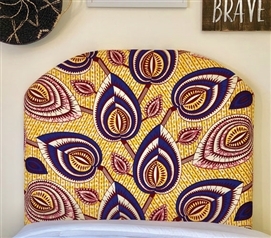 Our one of a kind African Inspired College Headboards are obviously great to look at. But the construction and ease of set up are also huge factors into why you need to add one of these unique Twin XL headboards to your dorm bed. Made with durable wood and foam and covered with soft material with great patterns, these incredible college headboards will add style and support to your Twin extra long bedding. 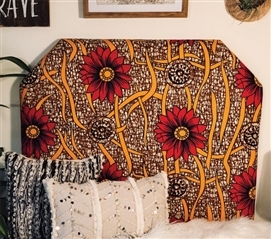 Our African Inspired College Headboards are some of the best college decor items out there. 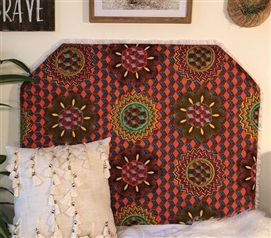 Designed with lively patterns and pretty vibrant colors, these unique dorm headboards will make your extra long Twin bed one of a kind. The amazing colors and designs on this Twin XL headboard will help boost the overall look of your dorm decor. 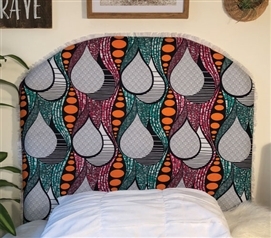 These dorm headboards are also made with the best material to give you a sturdy and comfortable place of support if you're sitting up on your Twin XL sized bed.